Amongst the many food blogs I read on a regular basis, one that never lets me down is The Kitchn. 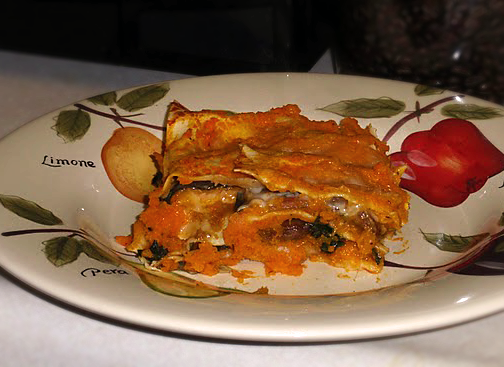 In its semi-recent "Best Healthy Casserole" contest, the winner was this Vegetable Lasagna with Butternut Bechamel. With it's use of healthy colorful vegetables in a creative way, I had to give it a try. The result received mixed review from me and Rob: I loved it, but Rob just thought it was okay. As a bonus, since Rob didn't like it as much, I got to eat all the leftovers! I would definitely recommend it and would love to make it again. The only changes I would make to my initial preparation are that I think I would have liked it better if i made the butternut bechamel a bit thinner, and I miscalculated the spacing of my lasagna sheets, so there were a few "holes" in the layers. 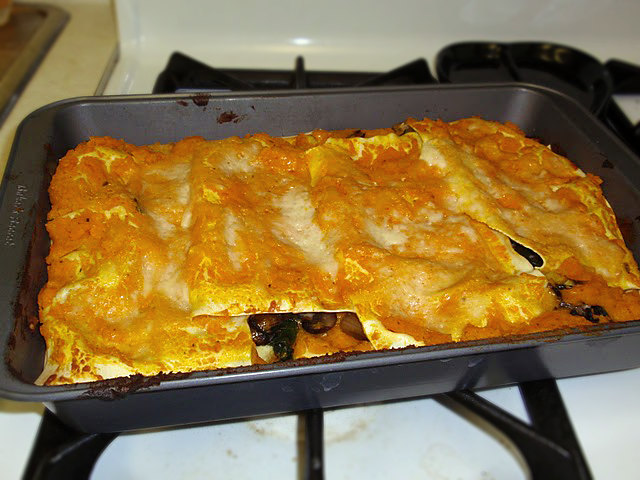 I've posted the recipe below. I hope you give it a try and enjoy it as much as I did. Remove the stems and ribs from the chard leaves by folding each leaf in half lengthwise and using the tip of a chef's knife to slit away the main rib. Chop each rib and stem into 1/2-inch pieces. Roll each leaf up into a cigar shape, cut it in half lengthwise, and then crosswise into thin ribbons.